This article originally appeared at the Mountain Journal and is republished here with permission. Right now, as you read these words, it is perfectly legal in the state of Wyoming for a person to climb on the back of a snowmobile and chase down wild wolves, pursuing them until they drop from physical exhaustion. And, if that’s not enough, you can then run them over relentlessly with the machine, injuring them until they die. You don’t need a hunting license, nor even a bullet to kill a wolf. You can do the above with impunity across roughly 85 percent of Wyoming which, as the “Cowboy State” encompasses almost 98,000 square miles, including vast sweeps of public land. You don’t need a reason to justify your actions either. Even if game wardens were to bear witness, it is highly unlikely you would catch any flak — unless your conduct happened to startle a deer, elk, pronghorn or domestic cow or horse, and then you might earn a scolding for harassing wildlife or livestock. In fact, wolves, which were recently taken off the list of federally protected species and their management handed over to the state unconditionally in 2017, can be killed by virtually any means, any time of day, any day of the year, without limit, in most of Wyoming. Never in the proud modern history of American wildlife conservation has an iconic animal commanding such mystique as a wolf been the subject of overt government policies encouraging its re-eradication after millions of public dollars were invested in species recovery. Just because something is legal does that mean it’s ethical and moral? And, if something isn’t ethical or moral, should it then be legal? It isn’t even that, as charismatic social animals, wolves in Wyoming are treated as worthless. Their status, by intent, is actually lesser than that because they are relegated pejoratively to “predator” classification — another word for vermin — reserved for feral cats, skunks, and exotic rats. Lawmakers in Cheyenne, the capital, have long resented wolves being brought back to their state. They regard the native canids as unwanted liabilities imposed upon them, though the presence of wolves in Wyoming’s top two tourist destinations, Yellowstone and Grand Teton national parks, helps generate tens of millions of dollars annually for local economies because they attract legions of avid wolf watchers. Echoing a mentality that first rose on the 19th century frontier and still continues, Wyoming’s attitude toward wolves is driven by deep-seated antagonism and defiance. Accused of “devastating” big game herds and wreaking widespread havoc on the livestock industry in spite of scant evidence to support these claims, lobos in the vast majority of Wyoming (except for just 15 percent of the state that includes Yellowstone and Grand Teton) share despised company with another canid unique to North America, the coyote. Snowmobiles aren’t the only non-firearms tools hunters can employ to destroy these carnivores; lobos, coyotes and their young offspring can be felled with poison, flattened by ATVs, snared, and incinerated live by pouring gas or dynamite into their dens and then lightning a match — acts that most would consider barbaric. If a person doesn’t want to do the killing himself, he can summon gunners employed by a federal agency called Wildlife Services, a division within the U.S. Department of Agriculture, to shoot wolves and coyotes from the sky using aircraft. Today, critics partially blame the U.S. Fish and Wildlife Service — ironically the very federal steward in charge of nurturing imperiled species toward recovery — for allowing it to happen. Former national director of the Fish and Wildlife Service Dan Ashe told Mountain Journal last summer the agency must abide by states’ rights and the way the Endangered Species Act is currently written, respecting the wishes of whatever states decide to do after an animal is returned to their custody. (The same rationale would apply to the hand over of Greater Yellowstone grizzly bears from federal to state jurisdiction). In autumn 2018, Chief U.S. District Judge Dana L. Christensen in Missoula, Montana, citing deficiencies in the government’s bear recovery strategy, ordered that grizzlies be returned to federal protection under the Endangered Species Act. Still, in light of what’s happening with wolves, there’s little wonder, observers say, why conservationists have dubious trust that state management in Wyoming will work out well for bruins. The Fish and Wildlife Service initially told Wyoming it would demand that wolves be classified as a game animal across the entire state, thereby ensuring they be managed professionally, like other major species, with hunting quotas and seasons, the same as they are in Montana and Idaho. The Wyoming legislature and governor, however, defied the demand and the Fish and Wildlife Service capitulated. According to Wyoming statute, wolves in four-fifths of the state can be killed “with, from, or by use of any aircraft, automotive vehicle, trailer, 35 motor-propelled wheeled vehicle or vehicle designed for travel over snow.” Predators are exceptions to protection under animal cruelty and wildlife harassment codes. Not long ago, amateur footage documented a bearded hunter, appearing like a character lifted out of Mad Max, roaring on his snowmobile, purportedly across Wyoming’s open, frozen, snow-covered hinters, chasing down coyotes. The video was sound-tracked with a country-western tune. Notably — and this is important — the film mentioned above, titled on Youtube “Running [email protected],” wasn’t the product of a covert investigation conducted by an animal rights organization; it was carefully produced by a “hunter,” freely shared and promoted ostensibly to attract personal attention — and glory. For perspective, were a citizen to treat a domestic dog, cat, horse, cow, lamb, wild deer, elk, or pronghorn this way the individual would likely face animal cruelty charges or be arrested on violations of game laws, bringing fines and potential jail time. (Read the Wyoming statutes here.) He would also earn shame in his community. Yet in Wyoming and other states in the American West, persecution of coyotes isn’t encumbered by any animal welfare statutes but venerated­ as a cultural tradition. If you can, take a look at the photo and video, linked above. They offer brutal glimpses at reality, and they speak not only truth on the ground but to the fact such behavior is condoned by political and social leaders in Wyoming, who let them happen without comment. 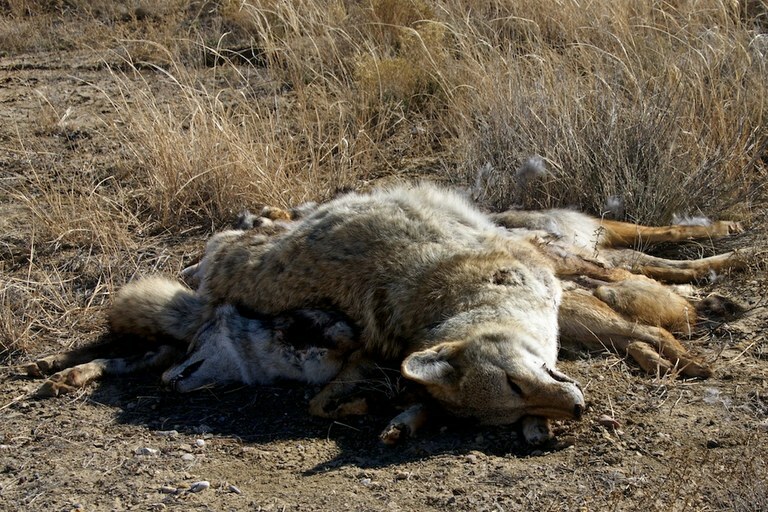 Killed coyotes, piled on a roadside in New Mexico. WHEN IT COMES TO ETHICS in hunting and the principle of “fair chase,” is there a common playbook that prescribes how humans ought to conduct themselves when stalking wild animals for food, trophy and thrill? Consider the circumstances of still another incident involving a sportsman from the northern Rockies whose controversial conduct made headlines around the world: The case involves a (now former) Idaho Fish and Game commissioner named Blake Fischer. Indeed, the media and animal rights activists eventually got hold of Fischer’s pictures and the images went viral, meeting with widespread condemnation, rivaling the viral uproar created by the killing of Cecil the African lion by a Minnesota bow hunter. Idaho Gov. C.L. “Butch” Otter, saying he was embarrassed by what Fischer did and under pressure, called upon the commissioner to tender his resignation, which he did with a tone of contrition. Fischer then, reportedly, received death threats purportedly from animal advocates. One of the arguments made in Fischer’s defense is that killing a family of baboons is perfectly legal — an accepted practice in African nations like Namibia where it happened. Essentially, it’s no different from what occurs with coyotes, bobcats, foxes, prairie dogs and other species on a daily basis in the West. Just because something is legal does that mean it’s ethical and moral? And, if something isn’t ethical or moral, should it then be legal? Dog and cockfighting used to be legal, so did slavery and denying women and non-white minorities citizen status and the right to vote. 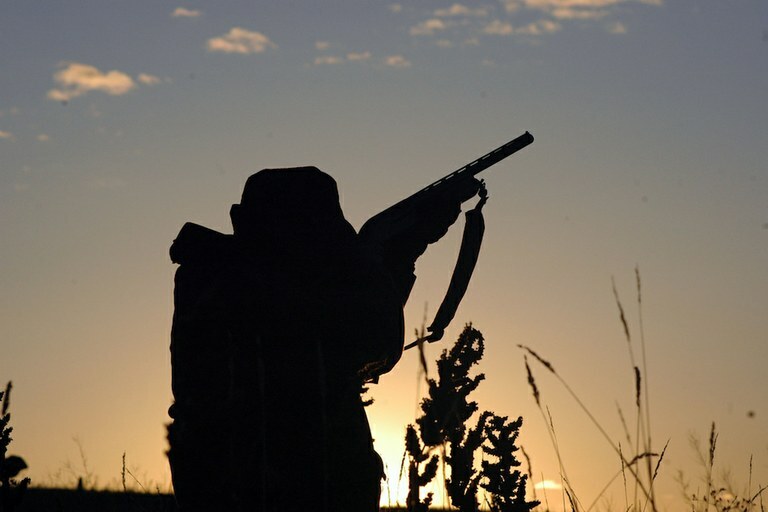 The question of what is legal versus what is ethical and moral in hunting figures prominently in a growing national discussion. It comes at a time when hunter numbers are in steady decline nationwide and have been for decades. More Americans are living in metropolitan areas and aren’t embracing the outdoor past-times such as hunting and trapping. By extension, state wildlife agencies, which rely upon revenues generated through the sale of hunting licenses, are struggling mightily with funding woes. Meantime, lines separating what’s legal from what’s ethical, moral and socially acceptable are the subject of individual tribal interpretation and fierce debate. Topping it off is social media. Such information sharing platforms did not exist a generation ago and today are powder kegs, inflaming passions and heightening the level of divisive discourse that exists among hunters, trappers and non-hunting citizens. Non-hunters often feel strongly that killing animals for sport, using them as target practice, as objects to turn celebrity-seeking hunters into social media stars, or to have animal antlers and stuffed heads on the wall, is anachronistic. Around the globe, the North American Model of Wildlife Conservation is held up by hunters as the Bible. Seven tenets are set in place that spell out clearly what the pillars of ethical hunting are. The principles, notably, were first nascently championed by the Missoula, Montana-based Boone & Crockett Club, an organization founded in 1887 by sportsman turned President Theodore Roosevelt. Although he has a less than evolved attitude toward predators, hunting historians today say Roosevelt, as a student of science, would embrace the knowledge that touts their important ecological role. They say he would be opposed to predator-killing contests and be appalled by the practice of running down wolves and coyotes on snowmobiles. Theodore Roosevelt, George Bird Grinnell and others were alarmed by how the absence of regulations, along with the slaughter of animals for short-term profit, the problem of habitat loss and there being no rules governing personal honorable behavior led to the decimation of many species, including the near extinction of bison. He condemned the Wild-West mindset that allowed a person to kill bison without limit, any time of day, any hour of the day, without a reason. Roosevelt warned that unless rules prescribing ethical wildlife stewardship were implemented, hunting itself could be lost. In the 21st century, has the poignance of Roosevelt’s concern come around full circle? These are the modern precepts articulated in the North American Model which were evolved and championed by Canadian biologist Dr. Valerius Geist, Shane Mahoney, John Organ, Ian McTaggart-Cowan and others. Wildlife are a public resource, held in public trust, to be managed by governments for the benefit of all citizens, present and future. Unregulated commercial markets for wild game that historically left wildlife populations plundered were eliminated and continue to be prohibited. Regulations exist, developed by citizens and enforced by government agencies, that mandate hunters and anglers secure licenses and they make clear how many animals can be killed via quota and the proper method for harvesting them. The freedom to hunt and fish — as well as viewing wildlife — should be an opportunity made available to all citizens. Those opportunities are enhanced in the West by the presence of public lands. Wild game populations should not be killed casually and only for a legitimate purpose as defined by law. Wildlife is considered an international resource because animals migrate across political boundaries. Science is the basis for guiding wildlife policy and management, not opinion or conjecture, in order to sustain healthy wildlife populations. None of the tenets stands on its own; each is interrelated. The Boone & Crockett Club devotes particular attention to “fair chase,” which it describes as “the ethical, sportsmanlike, and lawful pursuit and taking of any free-ranging wild, native North American big game animal in a manner that does not give the hunter an improper advantage over such animals.” It also places a strong emphasis on treating hunted animals with respect, minimizing pain and suffering of an animal by killing it as quickly as possible, and not wasting it. Talk to most hunters, government wildlife agencies, and hunting organizations such as the Boone & Crockett (the official keeper of big game hunting records), Safari Club International, the Rocky Mountain Elk Foundation, Ducks Unlimited and the National Rifle Association and they say they are devoted to upholding and advancing the North American Model. (Note: the author of this story has been a lifelong hunter and angler and went through hunter safety at age 12 in 1974). Mountain Journal contacted several widely respected experts on hunting, all of whom have spent their lives killing animals for food. One of them is Montanan Jim Posewitz, a member of the Montana Outdoor Hall of Fame, who wrote a book titled Beyond Fair Chase that for years has been distributed to students young and old who enroll in state-sponsored hunter safety courses. He is also an authority not only on the hunting values of Theodore Roosevelt but in interpreting the North American Model. Here is what’s poignant: Posewitz and others identify several legally permitted hunting activities in America that, in their determination, grossly fail to pass the rule of fair chase and ethical standards laid out in the North American Model. Those contradictions are giving hunting a bad name, they say, resulting in it losing its appeal and credibility among the overwhelming majority of Americans who do not hunt. From Wyoming’s controversial promotion of open season on wolves to predator derbies and wildlife killing contests held across the country targeting animals ranging from coyotes to rattlesnakes; from baiting black bears that enables hunters to literally shoot food-habituated bruins over a barrel, to captive “canned” hunts staged behind fences, to using domestic hounds to chase down certain game animals, those we interviewed say such activities are harming the public perception of hunting at a pivotal time when the public image of hunting matters more than ever. Many see the Fischer baboon saga as providing a moment for reflection. Before going further, let’s take a snapshot at where hunting is today, provided courtesy of the National Survey of Hunting, Fish, and Wildlife-Associated Recreation assembled by the U.S. Fish and Wildlife Service every 10 years. As of 2016, about 11.5 million people in America considered themselves hunters. That may sound like a lot, but it’s less than four percent of the total population. As a percentile of citizens and in number of participants, the number is dropping each year and the slide shows no signs of self-arrest. According to hunter Natalie Krebs, writing in Outdoor Life magazine, “hunting participation peaked in 1982, when nearly 17 million hunters purchased 28.3 million licenses. Hunter numbers have steadily declined since. We lost 2.2 million hunters between 2011 and 2016 alone.” The five-year drop is more than four times the total current population of Wyoming. Few experts believe the trend line will ever be significantly reversed. Most agree that, if hunters refuse to take heed, hunting faces a reckoning. A major challenge is holding the line on existing hunter numbers. Hunting arguably enjoys a disproportionate amount of political clout in Congress but that clout is concentrated in a demographic that is mostly white, male, gray haired and fading. Maintaining its influence, people like Posewitz say, means that hunting must be perceived as a virtuous, defensible activity. 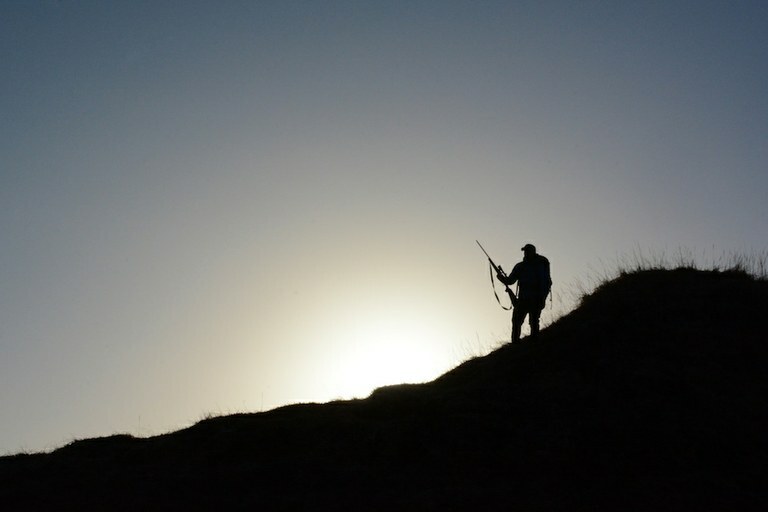 The silhouette of a hunter in Saskatchewan, Canada. Posewitz and Balfourd say tribalism in the hunting community has created an atmosphere of intolerance toward those who insist hunters adhere to higher standards. And Posewitz notes that it isn’t really about hunters getting busted posing boorishly for selfies; that’s merely evidence, he says. Rather, it’s the conduct and the mindset causing breaches in ethical hunting behavior to happen that warrants soul-searching for the hunting community. During the special election in 2017 held to fill the vacated U.S. House seat of Congressman Rep. Ryan Zinke of Montana, who President Donald Trump appointed as Interior Secretary, then-candidate Greg Gianforte attracted national attention when he body-slammed a journalist with The Guardian newspaper after the scribe enraged the candidate by asking a question Gianforte didn’t want to answer. He pled guilty to misdemeanor assault. Amid his stumping for votes, Gianforte made news another way. To win votes among rural Montanans, he invited Donald Trump, Jr. to join him on a prairie dog hunt in which the ground squirrels, which aren’t eaten or stuffed as trophies, were used only as live targets, shot and then left to rot. At a rally, Gianforte shrugged off heat brought by animal welfare advocates. “You should try it, because it’s fun,” he told one reporter, believing it would enhance his prospects of getting elected, not hurt him. The President’s son had himself been the subject of controversy when he posed with a knife in one hand and the tail of an African elephant he shot clutched in another. If political candidates and high-profile individuals are engaging in activity that attracts public attention and negatively inflames Americans, can defenders of hunting complain? Camilla Fox is a plucky carnivore advocate. The daughter of a veterinarian father who was a canid researcher and went on to become a former vice president of the Humane Society of the US, she grew up with a pet timber wolf rescued from a research facility. She knew she faced a formidable test launching a coyote-advocacy campaign from her own state. California, where she now lives (but spent many of her childhood years in Maine), is the most populous in the U.S. and second largest geographically, behind Texas, in the Lower 48. Although most of California’s nearly 40 million residents live within 100 miles of the Pacific Coast, most of the state is rural. There, the attitudes ranchers have toward predators is no different from their counterparts in Western interior, she says. Few wildlife conservationists in the West today devote more time to scrutinizing the killing of predators than Fox, Brooks Fahy, founder of Predator Defense, Wendy Keefover of the Humane Society of the U.S. and Suzanne Asha Stone of Defenders of Wildlife. You could also add former government trapper and predator-control expert Carter Niemeyer and the staff of the Center for Biological Diversity. Mountain Journal will be exploring their relentless scrutiny of the federal agency known as Wildlife Services in future stories. In 2017, Fox directed and produced the award-winning documentary, Killing Games: Wildlife in the Crosshairs to educate the American public about predator-killing contests. In the wake of the film’s release, the National Coalition to End Wildlife Killing Contests was formed, with the goal of a wholesale national ban on killing contest. Several grassroots groups rooted in the Greater Yellowstone Ecosystem, including Western Watersheds Project and Wyoming Untrapped, are part of the coalition. Sutton is a self-described “avid hunter and angler.” He spent his youth growing up in and around Yellowstone Park and is a lawyer by training. Over the years, he’s been a federal game warden with the U.S. Fish and Wildlife Service helping to prosecute poachers and served as park ranger in places ranging from Yellowstone to Yosemite. In recent years, he’s had leadership roles with World Wildlife Fund as well as overseeing conservation programs for the David and Lucile Packard Foundation and serving as vice president of the Monterey Bay Aquarium. Today, Sutton is executive director of the Goldman Environmental Foundation that annually awards the Goldman Prize — the “Nobel Prize for the environment” — to conservationists around the world who courageously advocate for resource protection. (Note: Sutton is also a board member of Mountain Journal). In 2014, he and colleagues on the California Wildlife Commission voted to outlaw wildlife killing contests that offered prizes and inducements for taking coyotes, bobcats, foxes and other species. They also launched a comprehensive overhaul of California’s predator management policies. (By 2019, the state will also ban all use of lead ammunition because of its toxic effects on the environment and for wildlife, despite resistance from groups such as the National Rifle Association). Fox called the California commission decision to ban contest killing historic and it was followed in 2018 by similar action in Vermont. Coyote contests may no longer be legal in those two states above, but they are in 48 others and even in California and Vermont they still can be killed in unlimited numbers without need for a license. There is no evidence supporting the contention that indiscriminate, haphazard killing of coyotes in contests has an appreciable impact in reducing conflicts with livestock or impacts on big game. At the same time, Dr. Fred Knowlton, a longtime coyote researcher in Utah, dismisses claims by wildlife advocates that killing contests can have devastating effects. He said that a coyote population can sustain annual losses of 70 percent and not be imperiled. 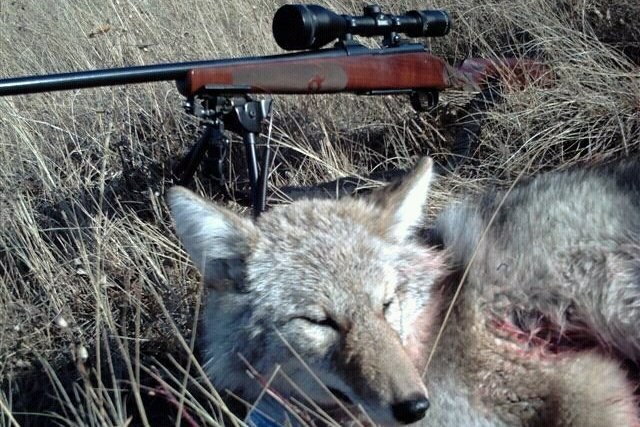 That’s not the point, Sutton says; the persecution of coyotes, that results in hundreds of thousands of them dying each year, is a poor reflection on American character and values — the antithesis of the code of honor for hunting the Roosevelt envisioned. DEFENDERS OF COYOTE-KILLING CONTESTS and those who call in coyotes using electronic devices often say animal rights activists are out of touch with reality, that environmentalists don’t understand the toll predators take. Coyote shooters are convinced that they themselves are fulfilling a noble conservation purpose. Plus, they note, stalking predators and killing them is challenging and makes for exhilarating entertainment. Participants in derbies and prairie dog shoots tend not to be meek or ashamed and it’s not hard to find individuals willing to share their opinions. Below is a description from Montana hunter Dustin Butler who is a regular on the coyote-calling circuit. Meanwhile, neighboring Wyoming has at least a half dozen large predator-killing contests each year. Most attract young men 40 and younger. A big one is the Wyoming Coyote Classic in Rock Springs. Contestant Eric Adams, interviewed by reporter Mike Koshmrl of the Jackson Hole News & Guide, shrugged off criticism as “just a bunch of guys hunting” and said the furs from killed coyotes aren’t wasted but sold. “Whether I’m hunting on the weekend or in a contest, whatever animal I’m going to kill, it is as ethically and humanely as possible,” Adams said. “Coyotes are so smart, and I treat them with just as much respect as I do deer or elk. This thought that we’re just a bunch of cold-blooded killers is nonsense. This is really, in my mind, no different than a fishing tournament.” (The big difference is that most fishing tournaments, to comply with conservation standards, are catch and release.) Both contestants in predator derbies and the wildlife advocates scrutinizing them, trying to get them shut down, share tales of how they’ve received death threats from menacing partisans on the other side. AS A BOY IN MEDFORD, OREGON, Mike Finley was taught how to hunt and fish by his father. He roamed old growth forests of the Pacific Northwest in search of deer and elk and cast his line into fresh and saltwater. His love of the outdoors led him to a three-decade career with the National Park Service. He was the only person to serve as superintendent of Yellowstone, Yosemite and Everglades national parks. Following a decade-and-a-half tenure as president of the Turner Foundation, where he worked with Jim Range, the late hunter and Republican conservation stalwart, to help establish the Theodore Roosevelt Conservation Partnership, Finley returned to Oregon and today is chairman of the Oregon Fish and Wildlife Commission. Oregon is wrestling with several issues that press the boundaries of ethical behavior and the norms of fair chase; they include hunters using drones in pursuit of animals to rifles with telescopic scopes and rangefinders that allow game to be taken from 1,000 yards, to high-tech bows that are a radical departure from archery implements of old which were given a special season because they were primitive. He and Mike Sutton are dear friends whose terms as commissioners in neighboring states overlapped. If he could, Finley would add Oregon to the list of states outlawing predator-killing derbies. FRIENDLY AND ARTICULATE, Brian Yablonski is executive director of the Property and Environment Research Center, a national think-tank called PERC. Based in Bozeman, Montana, PERC is devoted to advancing the principles of market-based conservation. Along with him being an avid hunter and angler, what few realize about Yablonski is that prior to recently taking the helm at PERC, he served as chairman of the Florida Fish and Wildlife Conservation Commission; in other words, he, like Sutton, helped set wildlife management policy for one of the most populous states in America. In addition, a law enforcement investigation into penning operations resulted in the arrest of 12 people and the issuance of 46 citations for violations related to illicit trade in live foxes and coyotes for use in penning events. 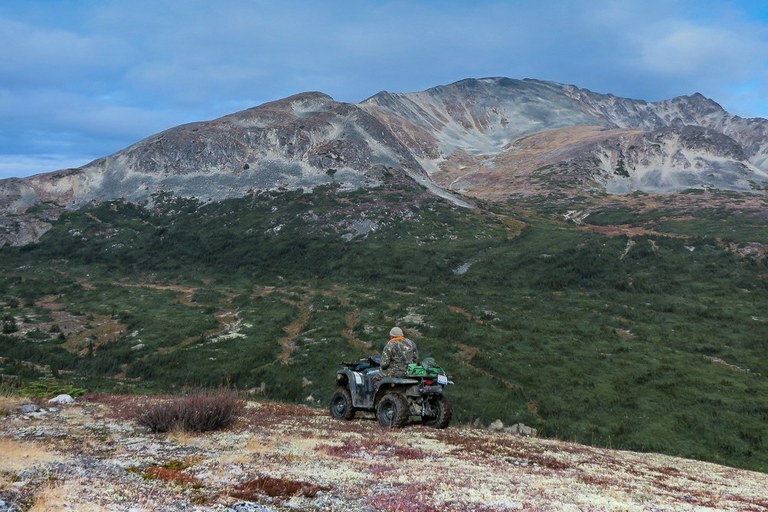 A hunter takes in the valley view from an ATV in Yukon Territory, Canada. FOR 39 YEARS, John Fandek managed the Carney cattle ranch in Cora, Wyoming, a tiny outpost in Sublette County along the flanks of the Wind River Mountains and near the banks of the Upper Green River. During that time, he had a front row seat to what he calls provincial attitudes toward predators. EARLIER IN 2018, I had a phone conservation with Brian Nesvik, chief game warden with the Wyoming Game and Fish Department. We chatted about the high-minded principles of the North American Model. When I told him about videos circulating on social media showing people on snowmobiles literally running down coyotes — and that there were comments in online hunting forums claiming the same thing was happening with wolves — he told me he was unaware. Hundreds of amateur and professional hunting videos exist on social media platforms, almost always portraying the host heroically stalking the quarry, getting in place for the kill shot, pulling the trigger, and then posing with dead animals afterward. Some of them are even featured in the varmint hunting section of national outdoor hunting retailer Cabela’s. Seldom do any of the films tout the virtues or natural history of the animal or what its living presence had meant to the land. In the case of coyotes and prairie dogs, it is not uncommon for their carcasses to be spread out or stacked like cord wood, much like the photographs of old when anglers would catch and kill dozens of fish on a single outing, or when hunters would wingshoot dozens of birds way over today’s limits. No longer are such photographs from the olden days in fashion but selfies showing dead wolves, coyotes and bears are. DEBATES OVER FAIR CHASE HUNTING and wildlife take many forms. In Wisconsin, it’s legal for hunters to use bear dogs to pursue and tree black bears until a hunter arrives to shoot the bruin and watch it tumble to the ground, similar to how hounds are used to chase cougars in some states. It’s ironic. In some states if a domestic dog chases a deer, it can be shot and the owner fined. In North Dakota during a recent hard winter, a state wildlife official warned coyote hunters using snowmobiles not to chase them through wooded areas or dense cattails because it might scare, stress or harass wildlife. Coyotes, their advocates say, are wildlife too. Why are predators capriciously put into a special category of disdain as if they are not? A huge row exists over whether the use of hounds to chase non-avian wildlife is ethical and those who do it say carnivores are so elusive they’d never be able to kill them. California recently outlawed the use of hounds to hunt bears by statute, over the objections of local houndsmen and their organizations. In other states, hounds can be turned loose to run cougars and bears merely for practice before hunting season begins. And this leads to another question: Should a hound owner receive any compensation if a dog is killed by a wild predator? Moreover, in Wyoming, if a pack of hounds, say, tangles with a female grizzly bear and cubs, and the bear tears into the dog, can the houndsman then kill the bear, arguing it was done in defense of personal property? When I asked Wyoming Chief Game Warden Nesvik that question, he said any incident would be approached on a case-by-case basis. It is legal in Wyoming to run hounds in portions of the Greater Yellowstone Ecosystem known to be inhabited by grizzlies. Another ethical, controversial gray area involves bear baiting. Here, stinky putrid baits — the smellier the better — are put out to create artificial bear feeding stations which lure bruins in so they can be easily killed as a hunter lies in wait. There are dozens of videos on social media showing hunters — including sometimes sub-teenage kids — shooting bears literally over barrels at feeding stations from mere feet away. Bear baiters are supposed to use non-human foods, though it’s a regulation known to be regularly flouted, with such delicacies as sugar donuts, bacon and potato chips set out to entice them. An outfitter in the Bridger-Teton National Forest, who runs 35 bait sites over a 40-mile area in the Greater Yellowstone Ecosystem, told a reporter for Field & Stream magazine that he cooked up 50 55-gallon bags of popcorn and left them out to lure in bears. It runs directly counter to the widely circulated slogan of ethics — “a fed bear is a dead bear” — that is invoked by the Wyoming Game and Fish Department in its public education efforts. A non-hunting tourist could be fined for deliberately habituating wildlife with food because it’s bad for the animal and creates potential dangerous conditions for people; in Yellowstone and Grand Teton, for example, sloppy disposal of food or trash on the trail or in camp could result in a visitor being fined and potentially banned from entering the parks. While Montana prohibits black bear baiting because it is deemed inconsistent with fair chase and hazardous, Wyoming allows it, including in parts of the Greater Yellowstone Ecosystem known to be inhabited by grizzlies. Nesvik told me that if a black bear hunter sees a grizzly frequenting a bait station, the person must immediately stop the feeding and report it to the Game and Fish Department. However, just because the baiter didn’t witness it doesn’t mean a grizzly hadn’t visited the site and got it hooked. Nesvik said coyote-killing contests also fall under the purview of the Wyoming Game and Fish Commission, whose political appointees made by the governor and, arguably without exception, have advanced the interests of livestock as much as wildlife. Rifle hunting in Montana, in 2017. LATE IN APRIL 2018, in a part of Park County, Wyoming just east of Yellowstone National Park, an event called “Predator Palooza” was staged by a local saloon in collaboration with gun enthusiasts. But this was not a music festival held in celebration of wildlife predators. Lethally targeted were wolves, coyotes and bobcats in an event billed as providing family entertainment and helping kids get interested in hunting. Delving into the history of predator-killing contests, Fox says she believes the first official one was held in 1957 in Chandler, Arizona outside of Phoenix. Fascinating perhaps is that they’ve become more numerous in recent years as hunter numbers nationally are receding. What does that say? “It means that as the pool of hunters continues to shrink, the number of those partaking in ethically-questionable events is growing and that doesn’t bode well for hunting,” Sutton says. As you read these words, another new derby, “The United States Predator Challenge” is getting underway. And it is has attracted ridicule from the National Coalition to End Wildlife Killing Contests and its more than 30 member organizations. The event involves two-man hunting teams (yes, it specifically says teams of men) traveling to two of three different regions of the country and killing as many coyotes as possible. 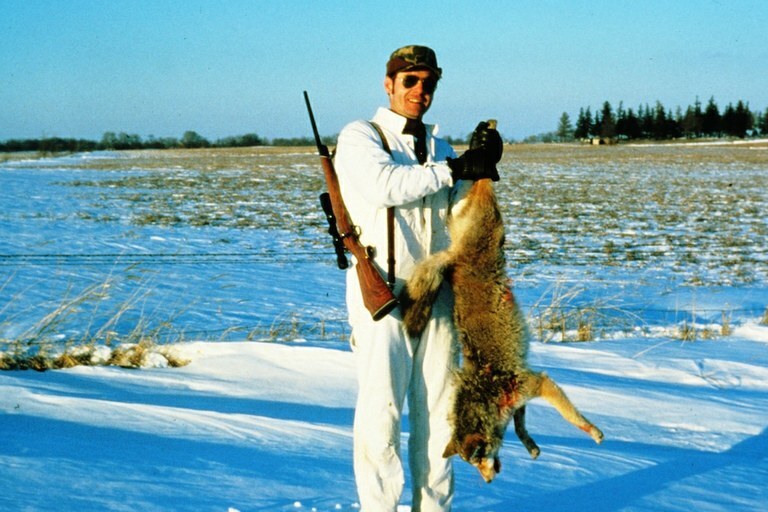 Those who kill the most will win tournament prizes, including a champion belt buckle Contestants can kill coyotes on both public and private lands, which adds to the controversy — federal land agencies like the Bureau of Land Management often directly approve the events or they condone them via indifference. Fox called it was reprehensible that charity to help seriously ill people was being used to justify its purpose. It’s worth noting that Boone & Crockett is opposed to wildlife killing contests and derbies, seeing them as contrary to tenets of the North American Model, namely that there is no scientific basis and that monetizing animal killing is wrong. “Predator-killing contests are abominations, an insult to the history of life on this planet,” says Mike Phillips, a professional wolf biologist, a citizen who has been elected to serve multiple terms in the Montana House and Senate and who is director of the Turner Endangered Species Fund in Bozeman. Phillips, who hunts deer and elk, was one of the scientists hand-picked to help complete the restoration of wolves to Yellowstone National Park. Phillips said that during the 2019 Montana legislative session he intends to introduce a bill that would outlaw predator-killing contests in his state. “I admit, I’m old school when it comes to hunting and I find the rise of popularity in varmint hunting and making a spectacle of it on social media to be disgusting,” he said. Looking south across the state line, Phillips says the least Wyoming could do with wolves is make them a game species across the entire state, sell licenses to support scientific research into animal population the same way it does with elk, deer, pronghorn and other species. CONSERVATIONISTS SAY it’s not only the kind of wildlife killing that is permitted in Wyoming but that, in the case of wolves, the state almost has a “look the other way and don’t tell us” attitude. Wyoming Game and Fish with all big game species has management objectives, closely monitors populations and sets seasons. State biologists admit they really no idea how many wolves are being extinguished in 85 percent of Wyoming where they are classified as predators. Wolves there don’t count toward the state’s promise to maintain a minimum population. Notably, there are also zones in the Greater Yellowstone Ecosystem where the number of grizzlies don’t count in the state’s promise to maintain a viable population. Wyoming has a grudge against the federal government and environmental groups for bringing wolves back and the fact that it doesn’t extend them game status over all the state puts them in violation with the spirit of the North American Model, critics say. And now with Chronic Wasting Disease rapidly expanding, and scientists pointing out the role predators can play in slowing the spread of disease, Wyoming not only continues to artificially feed elk but it has an aggressive policy to keep wolves at the lowest numbers. Hostility toward predators may be de rigueur in the rural West yet it runs counter to changing sentiments in the country, some note. In the late 1970s, the late Stephen Kellert, a professor at Yale University, gained renown for gauging public attitudes about the human experience in nature. One of his studies looked at feelings people had toward different animals. He interviewed 3000 people and identified a stigma toward wolves and coyotes. Recently, a group of researchers from Ohio State University revisited the data and provided an update publishing the results in the journal Biological Conservation. A hunter stands on a ridge on Adak Island, Alaska. THEODORE ROOSEVELT was a product of his time. He may have been a founding father of the North American Model, but modern ecologists say he had his own blind spots with ecological thinking — in particular his belief that predators had to be erased to maintain healthy big game herds. It’s thinking that’s been roundly debunked. John Laundre, a carnivore biologist who conducted field research on mountain lions for renowned researcher Dr. Maurice Hornocker, wrote a provocative essay recently about whether trophy hunters qualify as conservationists the way other hunters are. Laundre criticizes the introduction of exotic species to provide huntable fare and more trophy targets when wildlife managers know they compete with native wildlife, cause habitat damage such as the case of wild boar, and sometimes serve as disease carriers. Laundre directs his harshest words toward hunters and hunting groups that focus on helping animals good for the dinner table, yet discount the role predators play in regulating ecosystems, including, as in the case of Chronic Wasting Disease, limiting the spread of disease. Laundre is referencing the reintroduction of elk to old haunts east of the Mississippi River and allowing whitetail deer populations (linked to a corresponding abundance of tick-related illness) to explode while continuing to aggressively target coyotes, foxes and pulling the plug on red wolf recovery. Posewitz convinced that Roosevelt, had he lived long enough into the 20th century and availed himself to science, would have evolved his thinking about the role of predators the same as pioneering ecologist Aldo Leopold did. Where Laundre and Posewitz agree passionately is that Roosevelt would not allow his name, nor the North American Model, to be invoked to justify predator-killing contests. Those contacted by Mountain Journal say the war on predators is about more than running coyotes down on snowmobiles or killing contests; it is a fight for the survival of hunting itself. The controversy surrounding delisting of the Greater Yellowstone grizzly population is a prime timely example. More than 650,000 people submitted comments on the Fish and Wildlife Service’s plan to give states control over bear management, the vast, vast majority were opposed to sport hunting of grizzlies. Still, Wyoming and its seven-member Game and Fish Commission voted unanimously to let 22 bears be killed; they were spared by Judge Christensen’s ruling in autumn 2018. As hunter numbers decline nationally overall, and as more citizens congregate in cities, the inability or refusal of hunting organizations and policy makers to heed the shifting demographics of public opinion comes at their own peril, he says. Ironically, people like Sutton say, if legislators and state game agencies don’t want to abolish activities that make hunting look bad, urban Americans with a weak stomach for animal killing may do it themselves. By referendum in different states and by public pressure, there have been successful voter-approved bans enacted on leg-hold traps, hunting with hounds, bear baiting and operating game farms. Some 50 years ago, when he was governor of California, Ronald Reagan signed a state statute banning the hunting of mountain lions and it has never been overturned. An animal doesn’t only possess worth if it can be killed and monetized nor, by extension, should it mean waging a war against the animals in the food chain that eat the ones treated as commodities. That’s misguided, he says. In fact, the intrinsic value of animals, the economics of non-consumptive nature tourism and the changing winds of social values are rapidly taking such thinking in another direction. He praises a grassroots citizen campaign launched last summer by five women in Jackson Hole, Wyoming called “Shoot ’Em With A Camera” that encouraged non-hunting citizens to apply for grizzly bear hunting tags. Although the purpose of those seeking tags was to prevent bears from being killed, it served another role by showing that people are willing to pay to keep iconic predators alive. Not only do their voices deserve to be heard but it could be a creative way — part of a new movement — to generate money for cash-strapped game and fish departments that rely on hunting license receipts and a tax on hunting-related equipment, Sutton explained. A coyote hunt in Wisconsin, in 2010. Todd Wilkinson is the founder of Mountain Journal and the author of several books, including the critically acclaimed Science Under Siege: The Politicians’ War on Nature and Truth and more recently, Last Stand: Ted Turner’s Quest to Save a Troubled Planet and Grizzlies of Pilgrim Creek: An Intimate Portrait of 399, the Most Famous Bear of Greater Yellowstone that features 150 photographs by Thomas D. Mangelsen.